CHWs, ttC, 7-11, PDH. These aren’t just your ordinary acronyms. 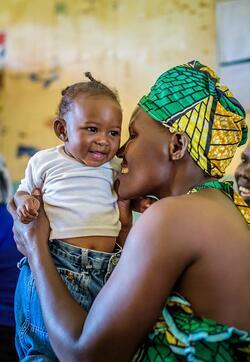 They stand for the very simple, very powerful approaches World Vision is using to strengthen health care systems and save the lives of moms and their babies. In honor of World Health Day, we invite you to learn what they are and how have they delivered double-digit improvements in just two years. Wilson is conducting one of his training sessions with Grace during her 5th pregnancy. At the age of 67, Wilson Masiga might consider slowing down and enjoying his seven children and forty grandchildren. Instead, Wilson still rides about 10km every day on a bicycle, traversing villages in Busia District, eastern Uganda, carrying the message of good health. 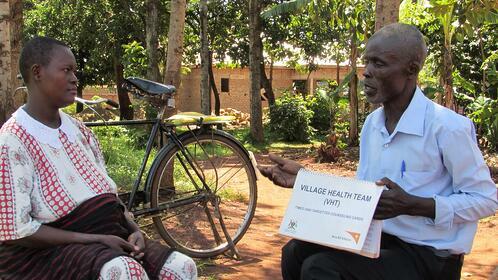 Wilson is one of the Community Health Workers (CHW) in this area. He has served in this role since 2011, after he and others were selected by the local leadership and community members. They were trained by the district health inspector, followed by additional training by World Vision in 2012. 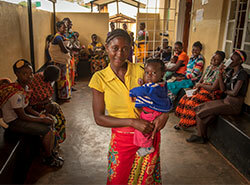 “We were trained in malaria control, nutrition and child protection, among others. 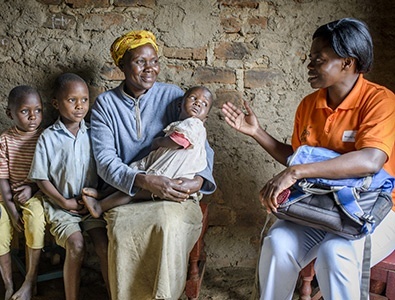 World Vision has continued to give us refresher training along the way, reminding us that we are the first ‘health centers’ to help our communities,” says Wilson. Little Isaac came into this world with the odds stacked against him. His mother died the day after he was born. He was so small people were afraid to touch him, let alone take him in as one of their own. Most of the people in his Ugandan village thought he would almost certainly die. Thankfully, Josephine was not afraid. This 47-year-old mother was touched by the tiny, fragile infant and decided to bring him into her home. Her children wanted him too, especially her sons David and Samuel.